What’s your least favorite chore to do around the house? If you’re like many people, it very well could be cleaning the gutters. However much you hate to do it, though, if you put off clearing your drainage for too long, you could run the risk of causing serious damage to your home. But how often do you really need to clean your gutters and when’s the best time to do it? Angie’s List recommends cleaning your gutters about two to four times per year. This may not always be absolutely necessary, though, depending on the location of your home. If your house is far away from trees, for instance, you have a dramatically reduced likelihood of debris and clutter accumulating and you can probably get away with one cleaning a year to remove dirt and dust buildup. 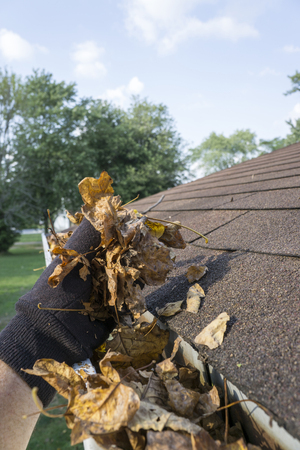 If you have trees that shed a lot of debris in your yard, like pine trees or deciduous trees, or you’ve noticed nesting birds or squirrels often on your roof, you’ll want to err on the side of caution and clean your gutters more regularly. Deciding when to clean your gutters may depend to some degree on your home’s location, but generally the best time to do a gutter deep-clean is in the springtime or at the end of fall. In the spring, pollen and winter loss from trees all ends up in your gutters, meaning that your gutters can quickly fill after spring showers. In the fall, leaves are changing color and falling from the trees at the end of the growing season – leaves that have a tendency to end up in your drains. Clearing out before winter ensures your gutters are clear and can help prevent the formation of ice dams or poor drainage of snow melt. Making sure your gutters are regularly cleaned and well maintained can often prevent expensive damage from occurring to your home, says Allstate. In the winter, ice dams that form when gutters are clogged or inefficiently draining can prevent water from flowing off the roof and lead to water damage to your shingles and eventually your roof. The stored weight of all this water can even tear gutters away from your home, potentially damaging fascia boards or other roofing structures. If you experience clogged gutters in the spring, improper water drainage may cause water to pool around your home’s foundation. This can mean that the water, without anywhere else to go, follows a path of least resistance right into your basement. This can lead to a whole world of other problems, from water damage and mold growth to structural damages. At Alaska Premier Gutters, we offer a full range of gutter services, from new gutter installation to gutter cleaning. Call us today at 907-272-2337 to make a springtime appointment to have your gutters cleaned.